#5. Simplify. Then simplify some more. 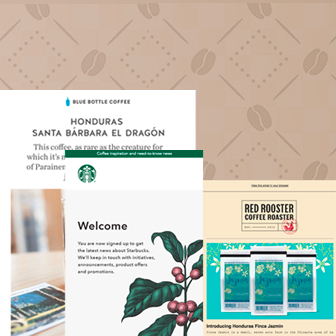 Is your fall email campaign ready to go? Even though temps across the country have been uncomfortably high—90s and humid, whew!—brands are in full fall mode. This means inboxes are cooling down with the latest back-to-school offerings, autumn launch announcements, and new seasonal promotions. If you haven’t joined in on the fun yet, our list will get you inspired. 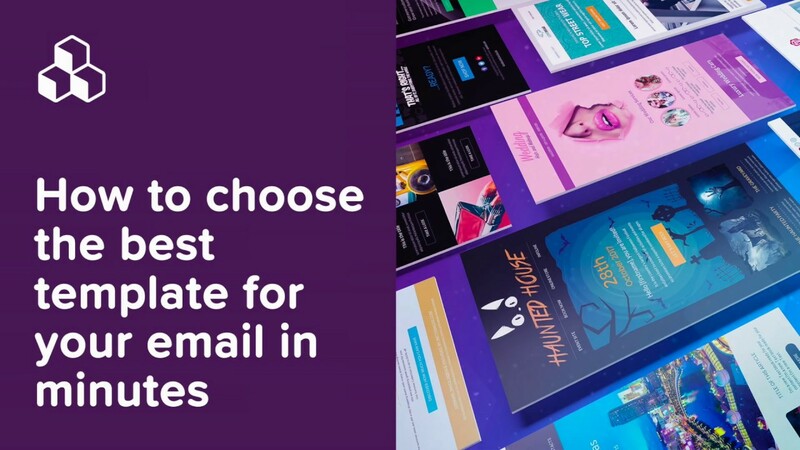 Whether you’re building your fall email campaign or something else, these design moves are ones to try! Read on and check ’em out. 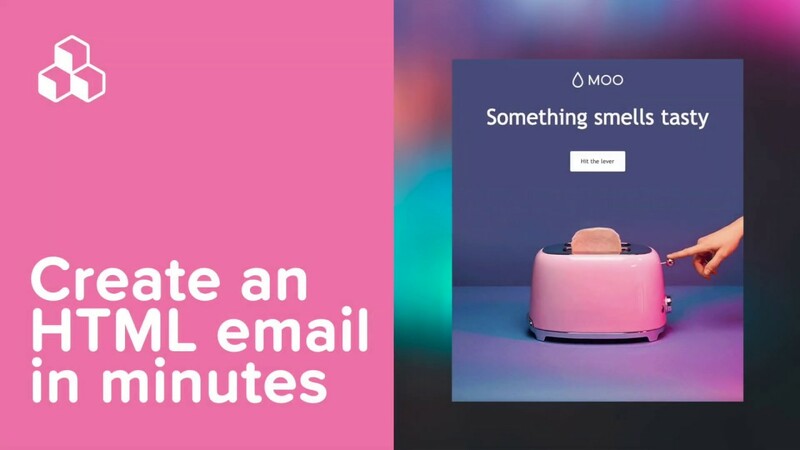 Animated GIFs don’t have to be the central component of your email. Lately, we’ve seen emails that offer just a little bit of movement to catch the eye. 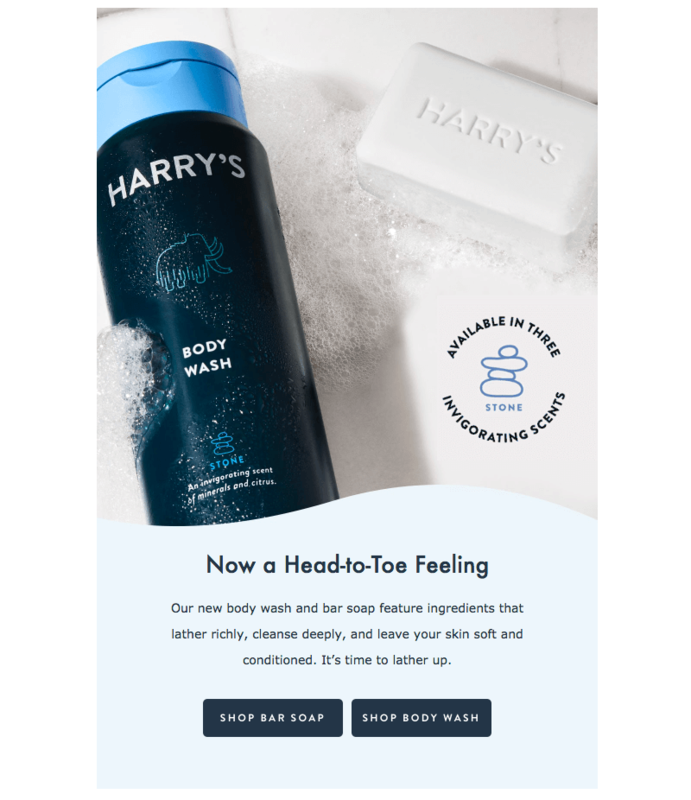 Check out this one from Harry’s introducing a new line of body wash and soap. Subject: Our Labor Day Sale waits for no man ⏰. GIFs are a great invitation to get creative! What better way to engage readers than to ask a question! We love a good in-email one-question survey. But look how this recent email from Suiteness turns that concept on its head, asking readers a question that helps them book a room—info that may or may not be for Suiteness’s own data collection. 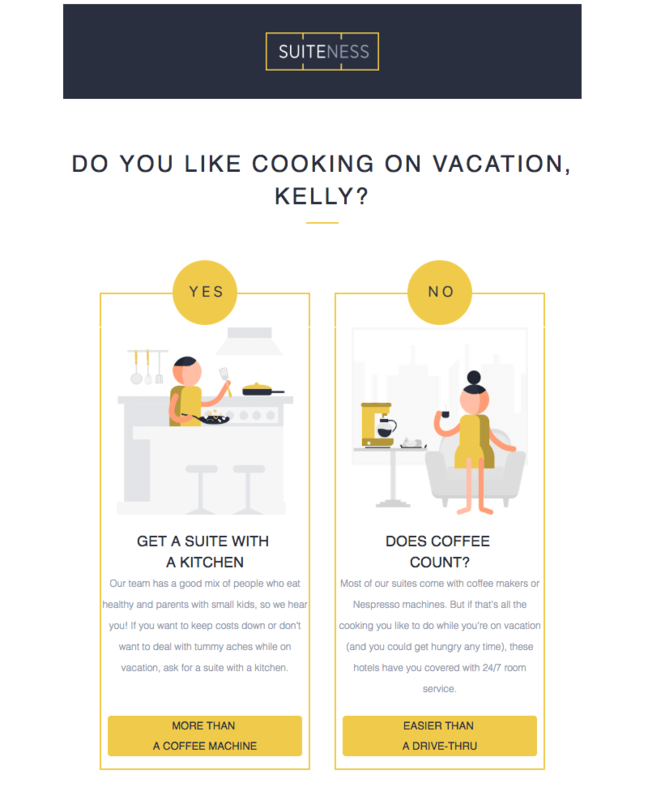 If you choose Yes, you’re taken to a landing page that lists hotel suites with kitchens. If you click No, Suiteness provides hotel options with 24-hour room service “for a no-chore vacation.” How suite—er, sweet—is that? Photo grids: almost all emails have ’em. But all photo grids don’t have to look alike! Did you know that in the BEE editor you can adjust the padding on an image differently along each side? This means you can create interesting shapes with white space, just like Need Supply Co. does in this stunning email. Such an unexpected, creative look for an email! It’s a simple design move that creates a lot of visual interest. But if asymmetrical design isn’t your thing, you can still make your photo grid interesting by varying image size and adding text atop an image in an out-of-the-ordinary way, like in this email from Helmut Lang. There’s no rule that you need white space between images. These photos jut up against one another, and it creates a nice effect. Plus, that large, yellow type is beautiful on the white background. And remember you can add live, mobile-friendly text on top of background images in the BEE editor. Subject: As seen on Instagram. Here are some design tips: Make sure you give image credit! (And, consider asking in advance for a user’s permission to share). 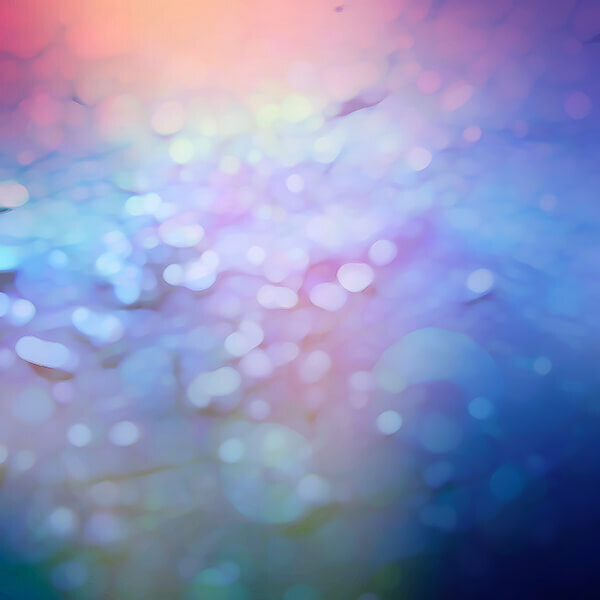 Use an HTML background color beneath and around your image or GIF, and make sure your CTA is bulletproof! We can’t write a list around here without including a bit of our very favorite advice: keep it simple! Emails are not websites. 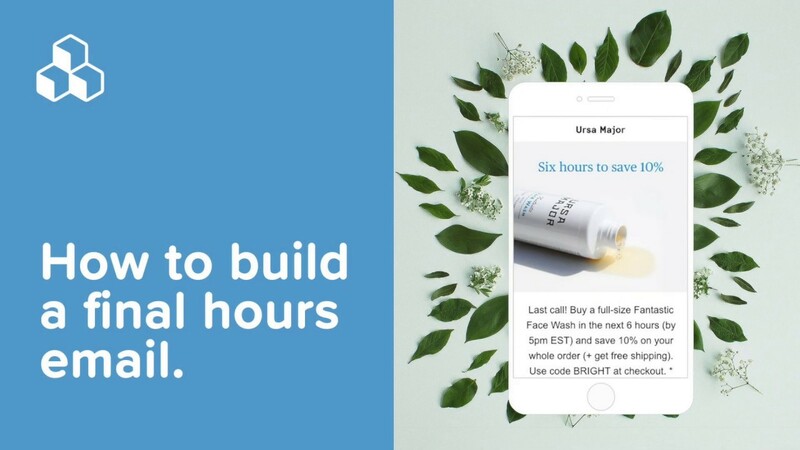 Next time you’re building a campaign, try stripping away a few sentences. A few images. A navigation menu. An extra CTA button or two. Just try, and see where you end up. You might love your streamlined look! For inspiration, check out the chic vibe Kotn creates in this ultra simple stunning message. Subject: Fall is in session. Here’s the full copy of this email: “Layer up. Fall is in season. And two layers are better than one. Shop the lookbook.” Boom. Your copywriter will love you when you give them this direction! But seriously, a few lines is all this email needs. The photography here is gorgeous, and the call-to-action only needs to be stated once. Attention spans are short. Give readers a break with a straightforward, beautiful email. Is there anything better than a good listicle? We gotta be honest: we love this organization technique. Turning content into a list always seems to make it more fun—and maybe even easier—to read and view. This recent email from Hugo Boss is a dynamic example of list fun. 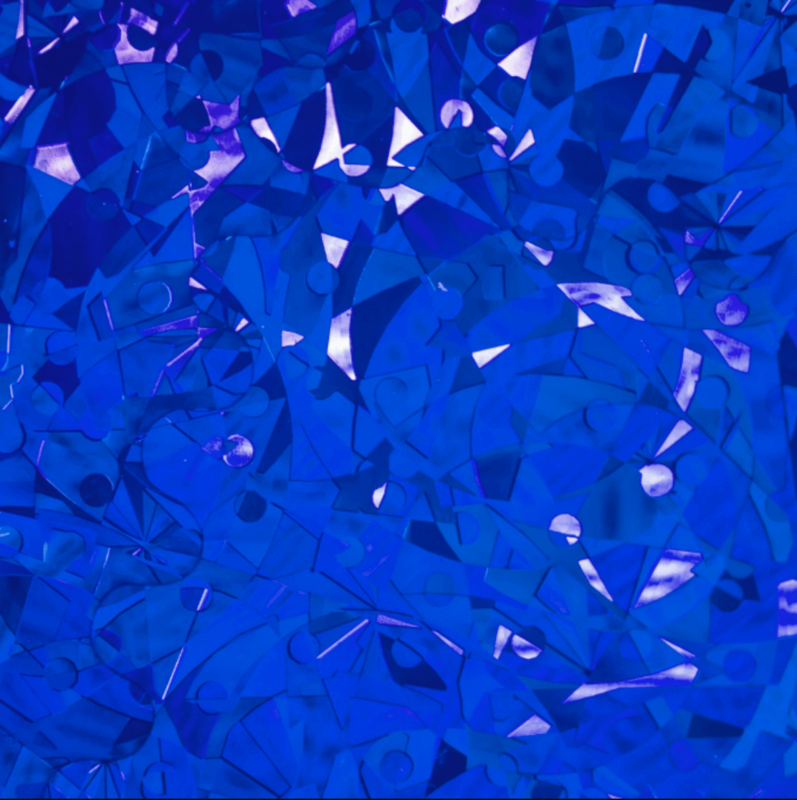 And check out this pretty example from Equinox, too. We love the zigzag layout and gray background! You can see the text is a bit blurred because it’s an image, though. Avoid that by using plain text in your photo collages! We hope you’re feeling inspired by these autumnal email tricks! 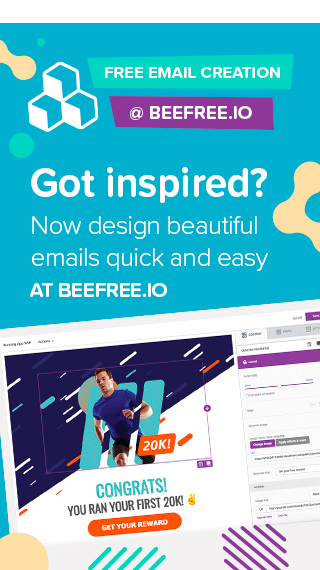 You can build your own fall email campaign today with a free trial of BEE Pro. The editor is intuitive and easy to use, and all your messages will be mobile responsive!